Two weeks ago, in the most dramatic installment of Fantasy Fantasy Football ever, Michael Fabiano came roaring from behind to stun Eric Mack and win the regular-season championship. It looked like Mack would run away with the title. But Fabiano made history — and made himself a legend — with the stirring comeback. This week, it’s the semifinals. Winner plays on, loser goes home. 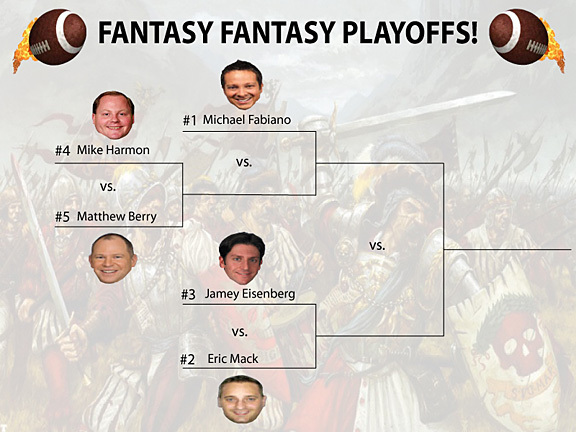 Are Mack and Fabiano destined to meet again in the championship? Let’s get right to it! Folks, we’ve never had a 1-seed lose in the first round in Fantasy Fantasy football, and this is why. Fabiano comes out guns ablaze, leaving Harmon rattled after an easy QB victory. Harmon comes back from the dead with the narrowest of victories on running backs. Fabiano could’ve put him away there, and you have to wonder if he’ll live to regret the missed opportunity. You also have to wonder if he’ll ever know about the missed opportunity. Such is Fantasy Fantasy Football. Fabiano reasserts himself as the top dog, taking the lead going into the final category. But let’s not forget that Harmon was here just last week. Comebacks are his specialty. Unfortunately, Jamey Eisenberg did not write a column this week. The timing was bad, but we’ve decided to let it slide and move the second semifinal to next week, Week 16. That means the championship will be held in the tricky Week 17, the hardest fantasy week of all due to unpredictable lineups. But if experts can’t navigate these tricky waters, they aren’t true champions, right? See you next week for Semifinal no. 2.